This workshop engaged participants in learning about important symbols in Ghanaian culture, and translating that learning into the process of using the symbols, manifested as stamps carved out of wood, which participants soaked in paint and then pasted onto cotton bags. The process worked at multiple levels: to introduce participants to a cultural heritage in Ghana, indirectly opening up possibilities for them to reflect on their own cultural heritage and beliefs; to allow participants to experience the aesthetic of working with materials (paints of rich natural colours, wooden stamps made in Ghana, cotton bags onto which participants stamped their Adinkra symbols); and to engage and enjoin participants in a creative arts process in a non-threatening and open environment. After warmly welcoming the group of participants, Cecilia gave a brief history of the Adinkra symbols, their origin, meaning, and usefulness in society. The Adinkra symbols are believed to have their origin from Gyaman, a former kingdom in today’s Côte d’Ivoire. According to an Asante (Ghana) legend, Adinkra was the name of a king of the Gyaman (Nana kofi Adinkra). Adinkra was defeated and captured in a battle by the Asantes for having copied the “Golden Stool”, which represents for them absolute power and tribal cohesion. He was finally killed and his territory annexed to the kingdom of Asante. The tradition had it that Nana Adinkra wore patterned cloth, which was interpreted as a way of expressing his sorrow on being taken to Kumasi, the capital of Asante. The Asante people around the 19th century then took to painting of traditional symbols of the Gyamans onto cloth, a tradition that was well practiced by the latter. 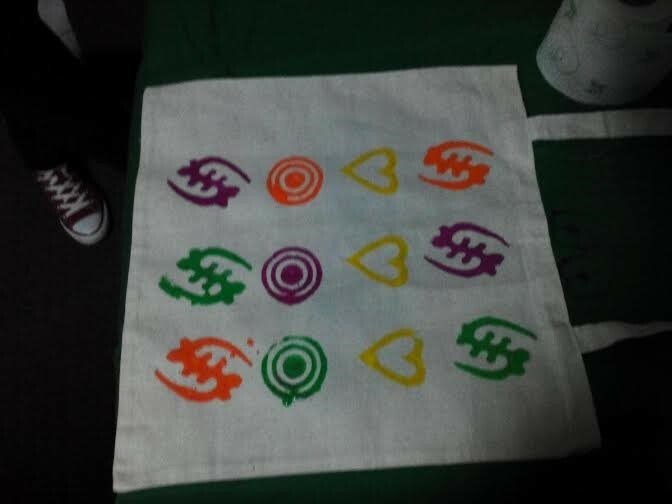 The Adinkra symbols express various themes that relate to the history, beliefs and philosophy of the Asante. They mostly have rich proverbial meaning since proverbs play an important role in the Asante culture. The use of proverbs is considered as a mark of wisdom. Other Adinkra symbols depict historical events, human behaviour and attitudes, animal behaviour, plant life forms and shapes of objects. 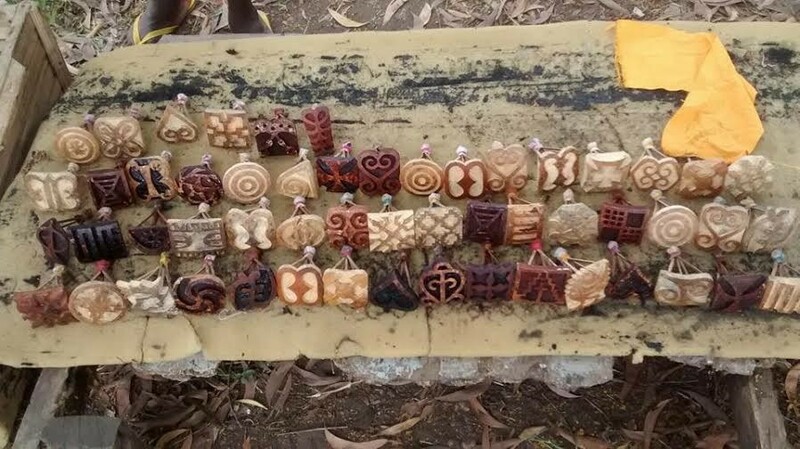 In fact, the Adinkra symbols continue to change as new influences impact on Ghanaian culture as some of the symbols now record specific technological developments. In explaining this history, Cecilia used cards showing the Adinkra symbols; these were passed around to the participants to read and think about. They were invited to choose a symbol whose meaning they felt was important to them. 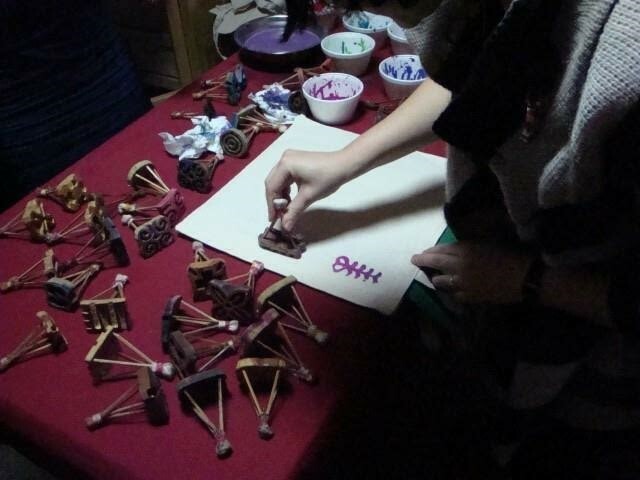 Then they could choose the corresponding stamp (made from carved wood) and a paint colour with which to stamp, and then print the stamp onto their cream cotton bag. The colours of the paints and the meaning of the symbols allowed the participants to express themselves, and their feelings about who they are and their place in the world. Cecilia then showed them how the printing is done and left them to print the symbol(s) of their choice. Cecilia spoke in English and translation was voluntarily provided by Andra, a colleague from the Romanian Association for the Promotion of Health (ARPS). Participants were all very happy and engaged, but there was a language barrier. Some of Cecilia’s words were difficult for the translator to translate, so participants who also spoke Romanian helped out. There were about five different nationalities in the group and not all of them understand English. Fortunately, two people in the group could speak languages that the other members of the group could understand, so they became our translators. Already a dialogue had begun among us as we began to talk about the symbols, the words in English and their meaning among one another. This opened up discussion further: “Where are you from?”; “What is your name?”; “What are you doing in Bucharest?”; “Why did you come to Romania?”; “Why did you come here tonight?” So the workshop provided a medium for the group of women to make further connections with one another, even though at first participants had grouped according to language/nationality/ethnicity (China, Romania, Moldova, Poland). Cecilia: I realised that no matter where I do this Adinkra symbols printing workshop, the response and reaction is almost the same. It does not matter whether we understood each other language-wise. 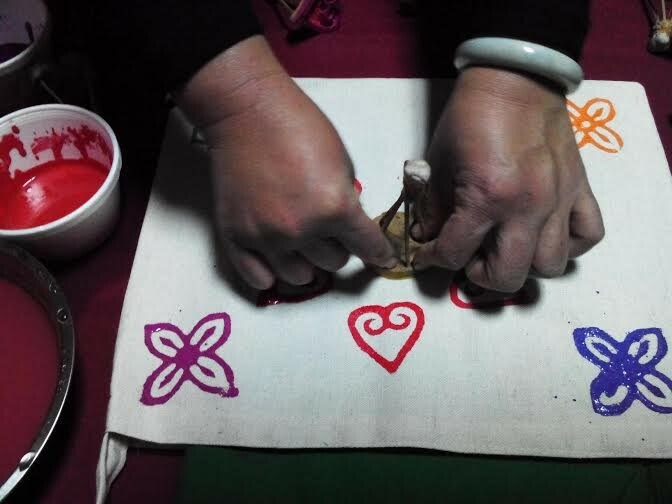 In the end the symbols, the bags and the paint become our language, our tool of communication in the gathering or space. The participants leave feeling very happy and content with what they have achieved within a very short time and they have something to remind them of their time spent at the workshop. The space becomes a place where new friendships are formed stories are shared between participants about themselves and their home countries. We had a brilliant time printing and chatting amongst ourselves and also dancing to music coming from Gameli and Richard’s workshop next door. Prue: As a participant-researcher observing the process of participants “crossing borders”, I noticed how quickly the group settled into the task, but employed many sharing and relational experiences that talking and creating together provided. Each was concerned in ensuring that she did the task correctly. While organising seemed important initially (how we set up the room, chairs, paints and bags on tables), the space soon became a site of multilingual/multimodal interaction and movement. To try and engage with the Chinese participants I used some of my basic Chinese to express delight with the Chinese woman (“hao kan” [that looks good]; “piaoliang” [attractive]; “wo shuo yi diar hanyu” [I speak a little Chinese], to which the Chinese woman replied in English “Beijing accent”, meaning I spoke in the style of standard Mandarin). The workshop helped to forge new connections—understandings, relationships, experiences, and a new sense of belonging—for all of us. Through shared smiles, warm tones and friendly dispositions, feelings of awkwardness or shyness that we shared initially were soon dispelled through the physical experience of expressing our beliefs and feelings through the stamps and colours (of the paint) and through our interactions with one another. The participants appeared to enjoy the opportunity to communicate in English and meet new people, and expressed interest in returning to Connect. 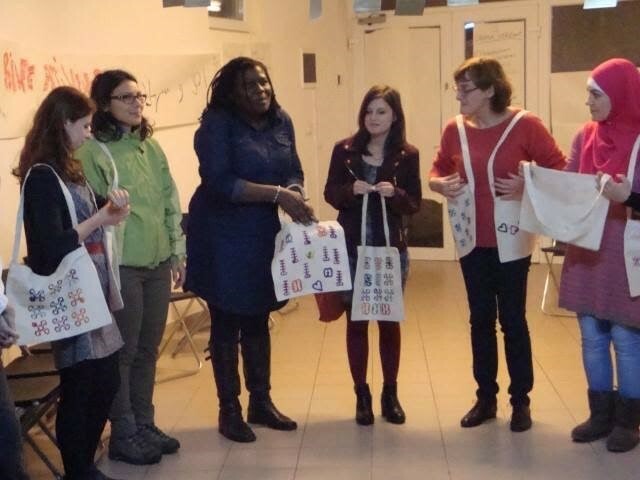 Although I was assisting Cecilia during this workshop, I too felt very much like a participant, sharing and learning the value, meaning and aesthetic of Adinkra symbols as a multimodal and communication medium that allow multilinguality and human relationships to flourish. This entry was posted in Case Study 3, CATC, Events, RMTC and tagged Bucharest, Case study 3, CATC, Cecilia Tordzro, Prue Holmes, RMTC, Romania, Symposium, translating cultures, workshop. Bookmark the permalink.